Our partners at CAED are seeing several positive outcomes in addition to their goal of independent learning. Children are speaking up, engaging in class and sharing not just their learnings but their opinions with parents and siblings at home. In our community, many children have been successful in bringing an end to harmful traditional practices such as child marriage, menstrual restrictions and isolation in their own families. Talking about adolescents’ reproductive health is no longer a social taboo anymore at home or school. Cultural change has been extensive and offered to parents, siblings, teachers, the community and policy makers too. Teachers are not hesitant to share lessons on adolescent sexual health and reproductive health (ASRH). Parents are taking an interest in their children’s studies, providing them meals on time and encouraging them to go to school regularly. They now take part in parents’ programs and meetings to end child marriage and promote gender equality. As a result of discussions during training sessions, two girls from Dailekh and Surkhet, and one boy from Dailekh went back to school. 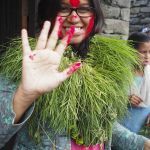 Similarly, three girls from Surkhet have started staying inside their house instead of living in a menstrual hut during their period. Peer educators in one school in Surkhet made 100 reusable sanitary pads so that their classmates could come to school regularly during their periods. As a result of multiple staff visits to change agent homes and health awareness sessions in the community, 210 women went to hospital to give birth last quarter instead of giving birth at home. In those households visited, 43% of husbands now take part in sharing household work with their pregnant or postnatal wives. With such encouraging outcomes, we anticipate further improvements in decreasing the number of school drop-outs, further reintegration, life-skills training, adolescent health and making life better for all. Our key learning is that to make significant change we need to address child, girls, women, gender, and health rights issues holistically.